Which milk should I drink? As you know, I only drink raw cow’s milk from our house cows in my daily kefir smoothie, and I drink herbal tea during the day. Recently a friend asked me if it was ok to drink soy milk. My first reaction was “no way”, but I thought I’d better do some research first, so that my friend can make an informed decision. Of course, if you have access to raw milk from cows or goats, and you don’t have an issue with lactose intolerance, this is the milk you should drink. I’ve written about raw milk before, in summary, raw milk contains nutrients (heat sensitive vitamins), enzymes and beneficial bacteria that are destroyed during pastuerisation. Often people who cannot digest processed milk find that they don’t have a problem with raw milk, and that it even has a healing effect. Read the other post for more details about raw milk. I grew up listening to New Zealand's National Radio. Not always voluntarily, but because my dad has a radio in every room, including the bathroom, and a portable transistor radio for outside work as well, and of course the car was tuned in at all times. He begins his day with radio and he falls asleep with radio and anyone in the house gets to listen to what he's listening too. I really only listen to the radio in the car, and I do like to listen to Australia's Radio National. I like most of the programs, but it seems that whenever I'm in the car for a decent drive its either boring programs, repeats of programs I already listened to, or no reception. And then I discovered podcasts. Its like you get to choose your own radio program schedule! Lately its has been relatively cold and we have been lighting the woodstove to heat the house and using it to cook meals, so I wanted to share our woodstove story with you. People are often surprised that we get frost here in Queensland. Sure, the majority of Queensland is typically frost free, but here in the South East corner we can experience frost, with some inland areas around Charleville having 40-50 frost days on average of the last 30 years. And certainly if you live in NSW, Victoria, Tasmania, and southern parts of SA and WA, you can expect a few frost days too. See the Australia frost map here. I know our winters aren't really cold by any means, we don't snow, in fact, we are more likely to have a beautiful sunny day after a frost, and can have a temperature increase of over 20 degC in one day! But this actually makes things trickier because we can ALMOST grow tropical plants, but it only takes one hard frost to knock them back until the weather warms up in spring. Fortunately there are a few tricks we can use to manage frost when we understand what it is and how it behaves. We only have a single cab ute, so any time it was too hot or too cold for Cheryl to ride on the tray, and we thought she should really be in the cab, she would end up laying on my lap. And at 25kg, she is not a lap dog! A few years ago when we agreed to look after a second dog (Chime), Pete decided to build a dog box so they could both sit safely and comfortable on the back of the ute in all weather. I was very excited to find Keeping a Family Cow: The Complete Guide for Home-Scale, Holistic Dairy Producers, by Joann S. Grohman in the Brisbane City Library. Its a great reference and covers everything including raw milk, diary products, milking, feeding and caring for your cow and calf. 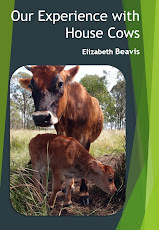 Of course, its written for the US market, so if you have an Australian house cow, I still recommend you read MY ebook too! You can read my full review here. 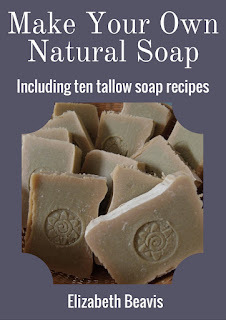 And there's more details about my eBook on my house cow eBook blog. Comfrey (Symphytum officinale) is a hugely useful herb and very easy to grow - in fact it can be too easy and has a reputation of taking over gardens! Its a herb that I think has a place in every garden. Comfrey is propagated by root-division, so all you need is to find someone else who grows comfrey and take a small amount of root and leaves, plant them and you will never be without some comfrey in your garden. Comfrey dies back in frost, and prefers moist cool conditions, so does not do well here in a hot dry summer. If you have ideal conditions for comfrey (not frost and not hot) you may have trouble with it spreading like mad, and it can grow rather large, with huge leaves. You can either plan for this by planting it somewhere appropriate, or you can confine it to a pot. Comfrey is so useful you might not find its possible to have too much comfrey! The last month of winter and we have had some frosty mornings, not much rain and everything has turned brown. We are feeding hay to the cows and we've booked the butcher for Romeo (the steer that we've had for about two years, not little Ruby in the photo below!). This July Pete and I took up the challenge once again to reduce and analyse our single use plastic consumption with Plastic Free July. Throughout July I have shared with you our progress, and lots of tips and ideas, and its been great to see you all join in. Now its time to look at our dilemma bag of plastic that we ended up with in spite of all our good intentions, and think about ways to improve. If you are going to post about your dilemma bag too, please link in the comments, it would be great to see what everyone learnt from joining in with Plastic Free July.